Cochin Shipyard Result: Official website @ cochinshipyard.com will be out with the Cochin Shipyard Result for workmen posts on contract basis. These posts mainly include the vacancies of Fabrication, Outfit and Ship Design Assistant. We believe by now all the candidates would have completed the tests/exams and are now eagerly waiting for the outcome. 195 CSL seats includes 22 different posts on contract basis for workmen. Please check out recruitment article attached at the end to know more. All of these 22 posts have different selection process and education qualification requirement. Also, the examination scheme and syllabus differ from each other. Hence, make sure that you select or search for the exact post applied and get the final list accordingly. 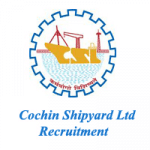 Cochin Shipyard Result 2019 will be announced in the career section of official CSL website cochinshipyard.com. Applicants can also check our “How to download CSL Result Online” pointers provided below. In case there are any questions or doubts please let us know in the comment section and our team will surely get back to you with relevant answers. Quickly check the recruitment table below and read the result based article carefully. The recruitment board of CSL recruitment has not yet declared the examination and schedules. They are expected to be out after the online applications are closed. Applicants are requested to bookmark the page so that the important updates regarding final selection list right here. Go through the selection procedure and check our recruitment article or the official Pdf attached to know more on posts announced from A to I. They are all on contract basis. Practical, Skill, or Physical Test. Cochin Shipyard Results date and CSL final list will be announced by the authority on its official website as mentioned above. They are expected to be out after the examinations are completed. Candidates can now know how to download the result from the steps provided below. Read the steps carefully and click on the link after that to get hold of the result. Results for various posts would be declared on different dates. We will let you know all the dates and details on these results right here. How to Download Cochin Shipyard Result 2019 Online? Visit the official CSL website @ cochinshipyard.com. Click on career option available at the top right side of the web page. A different web page will open with several notifications and advertisements. Scroll down the page and search for workmen on contract final list/result or Cochin Shipyard Result 2019 for specific post applicable. For example that can be post A, B, C till I. (as relevant to your application and examination). Click on the relevant option and check for your name, registration number. All the best to all the candidates who were selected for the practical tests and objective type test. 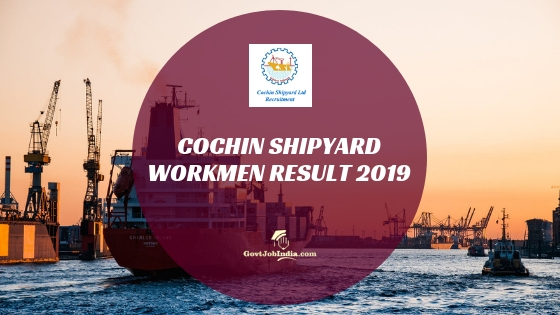 We hope you are are able to get all that you were looking for Cochin Shipyard Result 2019. Enter any of your comments or queries in the comment section below and our team will surely get back to you with responses on the same. For more government job opportunities check our website @ govtjobindia.com and you can also subscribe to receive regular e-mails on latest government jobs.